"The brig "Morne Fortunee" was hired for $50.00 a day by the RN 24/6/1803 to carry dispatches and was purchased into the RN about 29/8/1803. She was the brig "Glory" built at Bermuda in 1801 and was purchased for L3000, 105 tons." (Bermuda Hist Quarterly Vol 19, no 1, 1962). Captain Basil Hall joined the HMS Leander early in 1802, at age 14. She was a 50 ton frigate, flying the flag of Sir Andrew Mitchell and passed the winter of 1802/3 in Bermuda. "During the long winter of our slothful discontent at Bermuda, caused by the Peace of Amiens, the officers and young gentlemen of the flagship... were constantly balzing away among the cedar groves and orange plantations of these fairy isles." (Bermuda Hist Quarterly, Vol. 1, No 3, p 137-8). "Sir Andrew Mitchell", a Bermuda schooner, was purchased 1802 by the Royal Navy. (Bermuda Hist Quarterly Vol 19, no 1, 1962). Mar 16 1804 the "Young Sydney", Captain Joseph Tapper master, age 35, and mate Abraham Gould age 27, volunteers of the French Militia, was towed to Mangrove Bay in a gale which had blown them eastward across the Atlantic from the American coast. They were carrying salt from Turks Is. The ship struck coral reefs, was taken as a prize. She was condemned in the autumn of 1804, sold to John Morris on 2 Nov 1804 for 13 shillings and fourpence. (Bermuda Hist Quarterly Vol1, No4, 1944). To: His Excellency Sir Erasmus Gower. 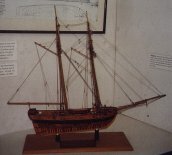 The sloop "Peggy" arrived in the Bahamas from Bermuda, 30 May 1810, in 10 days, with passenger Mre Vesey (CFE Hallett "Early Colonists of the Bahamas" 1996, p129). The sloop "Linnet" arrived in the Bahamas from Bermuda, 21 May 1811 with passenger Mre Vesey (CFE Hallett "Early Colonists of the Bahamas" 1996, p129). c1811, during the War of 1812, Mr Richard Darrell (1767-1861) was granted passage to England, in (?) the frigate Seahorse. A few days after they left Bermuda a ship hove in sight, which they first took to be the US frigate Essex, Capt Porter. The approaching vessel was discovered to be the British "Belvidere". (Bermuda Historical Quarterly, vol 1 no3, 1944, pp 142). 27 Aug 1812, The "Lydia", master and owner Captain Comfort S Rena, sailed from New London, Conn. bound for St Bartholomew in the West Indies with a full cargo. She was a combination brig/schooner (brigantine), 113 tons. A week out she was captured by the British ship-of-war "HMS Orpheus", Capt Hugh Pigot& master's mate John Hooper, and set for Bermuda where she made port 8 Sep. There she was brought before the Admiralty Court as a prize. (Bermuda Hist Quarterly, Vol 18, no 1, 1961). On 1 June 1813, the "Shannon" (38 guns) captured the "Chesapeake" (44 guns) off Boston Light after a sharp and decisive engagement that lasted only fifteen minutes. The commander of the "Chesapeake", James Lawrence, who was mortally wounded in the fray, was related to the Cox family of Bermuda, and his senior officer was William Cox, son of a Bermudian who had emigrated to America. (Bermudas Story, pg 132). The captain of this vessel, Sir Peter Parker Bart. died in battle in Sep 1814, and his body conveyed on the "Hebrus" to be buried in the Islands of Bermuda. He was buried 14 Oct 1814 at St George's Church burial grounds by the Rev George Rennell, Chaplain of the HMS "Albion" (St George's Church Register, Rev Philip Hudson). 8 Oct 1814 "His Majesty's ship "Albion", Rear Admiral Cockburn, and the "Hebrus" frigate arrived in Bermuda from the Chesapeake." (Royal Gazette & Weekly Adveritser). 8 Oct 1814 "His Majesty's ship "Albion", Rear Admiral Cockburn, and the "Hebrus" frigate arrived in Bermuda from the Chesapeake." (Royal Gazette & Weekly Adveritser). The "Hebrus" frigate on 2 Apr 1815 took the body of Sir Peter Parker, commander of the "HMS Menelaus" to be conveyed to England (Bermuda Hist Quarterly Vol1 No4 1944). In 1814, Thomas Tudor Tucker, born at Tucker House, St Georges, Bermuda and named for his uncle, the Treasurer of the US, commanded the "HMS Cherub" in an engagement off Valparaiso in the company with "HMS Phoebe", when the "USS Essex" was captured. (Bermudas Story, p132). On 1 August 1814, the HMS "Tonnant" with Vice Admiral Sir Alexander Cochrane K.B. and the frigate "Surprise" with Sir Thomas Cochrane, sailed from Bermuda, destined for Chesapeak Bay. See "Royal Oak" above. (Bermuda Historical Quarterly Vol XXV, No 1, 1968). The peace between Great Britain and the US was signed at Ghent on 24 December 1814. News had however not crossed the Atlantic before the last Naval battle took place 15 January 1815. The USS "President", Commodore Decatur ran on a bank off Sandy Hook, NY Harbour on 14 January. On the 15th, the "HMS Endymion" (Capt. Hope), the "Pomona", and the "Tenedos" engaged in firing shots at the "President", forcing surrender. The USS "President", Capt Stephen Decatur, was brought to Murray's Anchorage, Bermuda. Midshipman Richard Sutherland Dale died of wounds shortly after arrival and was buried at St Peter's, St George's. Midshipman R B Randolph later escaped the islands for NY.. (reference: Bermuda Hist Quarterly Vol XXV, No1, 1968). (Bermuda Hist Qurterly, Vol 1, No 3, 1944, p146). The peace between Great Britain and the US was signed at Ghent on 24 December 1814. News had however not crossed the Atlantic before the last Naval battle took place 15 January 1815. The USS "President", Commodore Decatur ran on a bank on 14 January. On the 15th, the "HMS Endymion" (Capt. Hope), the "Pomona", and the "Tenedos" engaged in firing shots at the "President", forcing surrender. The "President" was brought to Bermuda. (reference: Bermuda Hist Quarterly Vol XXV, No1, 1968). 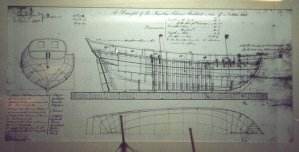 Samuel B Robinson, in his will dated 3 Sep 1819 (W14:268) stated he was master of the ship "Elizabeth" now in St George's Harbour. His brother Benjamin is a boat builder of Bath, Maine. (ref: Early Bermuda Wills, pg 493). Friday March 28 arr. His Majesty's ship Menai arrived at Chatham Dec. 31 from Bermuda. (Roman Citizen newspaper, Oneida Cty, NY - 1817). Thursday April 24. Sailed. His Majesty's ship, Leander, 50 guns, Rear Admiral Sir David Milne; K.C.B. Capt. Chetham sailed from Portsmouth March 15 for Bermuda and Halifax. The Freeling packet sailed from Falmouth Feb. 16 for Bermuda. Friday May 23 1817arr. H.M.S. Forth, Rear Admiral Griffith, Capt. John Louis, Bart. sailed from Bermuda for Portsmouth 11th inst. Monday May 26 1817arr. H.M. ship Dee from Bermuda. Tuesday May 27 1817 arr. H.M. ship Harrier, Sir. C. Jones Capt. from Bermuda. Friday June 6 1817 Sailed on Sunday last the Harrier, Capt. Sir C. Jones for Bermuda. May 24 1817 arrived at New York- Antoinette, Gillard - Bermuda; Eliza-Ann, Willis - Bermuda. Thursday November 13 1817- Sailed: H.M. ship Dee for Bermuda. Wednesday Dec. 17 1817 arr. Charleston sch. Neptune, Haywood from Bermuda 16 days. Thursday December 25 1817 - H.M.S. Dee from hence arrived at Bermuda the 20th ult. April 14, 1821: Sunday arr. H.M.S. Carnation, Capt. Hall, 8 days from Bermuda, with the English February mail, received in Bermuda by the Lord Hobart, Packet, in 40 days passage from Falmouth. May 5 1821: Thursday arr. H.M. ship Cyrene, Captain Tozer, 10 days, from Bermuda. March 11 1826, "launched near Hamilton Mr Samuel Wood's schooner 150 tons "Lady Burnaby" one of the handsomest vessels ever built here." (Bermuda Settlers, Mercer, p114). per Royal Gazette No 14, vol 1, 8 Apr 1828: "Just Received: for sale Adventure, from Nova Scotia, and for sale, 800 Bushels Potatoes in good order; butter, in crocks of 10 and 12 lbs. ; cheese; turnips; 2 M feet boards, half barrel corned mutton; 1 barrel Do. beef. Apply on board, at Todd's Wharf, or to S G Spencer. St George's, 25th March 1828." per Royal Gazette No 14, vol 1, 8 Apr 1828: "For Sale: The cargo of Brigantine Boyle, James P Brownlow, master, from ST Thomas, viz-- superfine flour, corn meal, navy bread, rice, corn, beans, blackeyed pease, tar, pitch, rosin, tobacco, and pitch pine boards 1 1/2, 1 1/2, and 3 inch. Ingham & Frith. Hamilton, March 25, 1828." per Royal Gazette No 14, vol 1, 8 Apr 1828: "The subscriber is now landing from the Brig Adelaide, from Trinidad, HHDs, and barrels, sugar, choice quality, molasses, in pancheons; writing paper; coffee, in barrels; chairs; all of which he will sell low, for immediate payment. John Wainwright. Hamilton, March 4, 1828. The brigantine Rover, James P Brenenlots(sp? ), master, from St Thomas with cargo for asale "superfine flour, corn meal, black eyed pease, navy bread, rice corn, beans, tar, pitch rosen, tobacco, and pitch pine boards. Mar 25 1828 (Royal Gazette, Apr 29, 1828). "The American brig Lion, Arthur Hall master, will sail for Bath, in the state of Maine, on or about the 1st June. A few passengers can be comfortably accommodated, by applying on board at Mr Sheddens's wharf." (Royal Gazette, 27 May 1828). The schooner "Grecian" was built for the British Navy, date unknown. Daniel Outerbridge Algate and his brother William died in a hurricane when the brig Triton was lost in 1832. (Hamilton Parish: Bermuda's Archictural Heritage Series 2002 pp210). Port of St George- cleared- The schooner Resolution, Capt. Nash, 2 days from Antigua, arrived on Sat last (before 5 Jan 1835). Passenger Mr F Jones. Adv. : "On board the Resolution" goods for sale, arrived from Antigua; Samuel Nash, Hamilton. (Royal Gazette, 5 Jan 1835) Port of Hamilton-entered:Jan 5 (1835)- Schooner Resolution, Nash, just arrived from Antigua; soap, sugar, tar, molasses (Royal Gazette, 8 Jan 1835). Brigantine Jabez, Tuzo at Charleston from the West Indies 12th Dec.1834. (Royal Gazette). By the brig Standard on Friday last, Capt. Burrows, brought report of Jamaica and newspapers: Brig Agenoria was at Port Maria, when he left; The Velocity at Kingston; HM ships Vestal and Racehorse at Port Antonio; Thurs morning last abt 100 miles westward of Bermuda, Capt Burrows saw a vessel with distress signal- American schooner Hope, Capt. Joshua M Johnson of Portsmouth, NH bound to Key West, out 7 days- saved the crew. (Royal Gazette, 12 Jan 1835) Jan 12 1835- brigantine Standard, Burrows, Jamaica; rum, sugar, pimento, yams &c to Astwood. Richard S Frith, aged 13, a native of Southampton, died at sea on board the schooner "Resolution" on July 17 (1836), en route from Wilmington to Demerara (Royal Gazette 4 Oct 1836). Capt. Joseph Nelmes Frith, aged 36, died in a boating accident on Jan 6, leaving a wife and 6 children. He had gone out in a boat belonging to W P Perot of Port Royal, with a crew of 8, who went to the aid of the brig Nehemiah, on the northwest rocks (with a cargo of lumber for Jamaica, from St Stephens, NB, under the Capt John Heney). Her rudder had been damaged in a gale soon after leaving NB. The Captain and crew were safely landed at Mangrove Bay, but attempts were being made to salvae some of the cargo, when the tragedy took place. The 8 men were never found. (Royal Gazette 9 Jan 1839). The brig "Gazella", burthen 73 tons, master Nathaniel Vesey, arrived 7 Feb 1842 at the port of New York from Bermuda (see passenger lists). 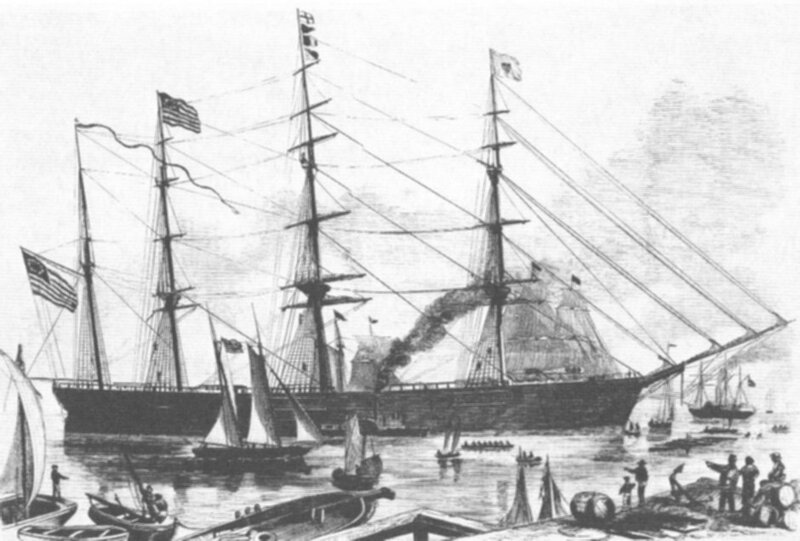 The brig "Telegraph", burthen 86 738/3500 tons, master G T T Wells, arrived 17 June 1843 at the port of New York from St George's, Bermuda (see passenger Lists). In the late 1840's Captian Daniel R Williams was master of the brig Somerset. (Sandy's: Bermuda Architectural Heritage Series).